PRODUCT: CEP #6403M Temporary Power Y Adapter, 2 ft., 50A Heavy Duty SOW Rubber Jacket with 6/3-8/1 Gauge Wiring. 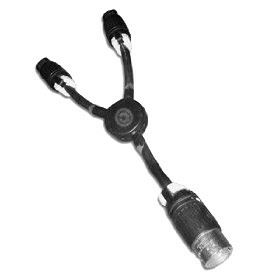 125/250V (CS6365) Plug to (2) 30-amp Connectors (L1430 250V). Price/Each. APPLICATIONS: Ideal for using two welders with high power generators such as WC12000HE generators. 100 Foot Long 10/4 SOW Grade Rubber Power Cord, with 30 Amp L14-30P Twist Lock Plug and L14-30C Outlet (4-wire, 3-pole @ 125/250V). Price/Each. L14-30P Male Electrical Plug, Heavy Duty 30 Amp, 125/250 Volt, NEMA L14-30P, 3P, 4W, Twist Type Locking Plug, Industrial Grade, Grounding. Price/Each.